The heat was on at Avista Stadium on Thursday. Game time temperature was in the low 90s and the game went to extra innings. The real heat, though, was felt at the third-base concession stand. In the top of the third inning, a small electrical fire on the roof of the building was put out by two stadium workers and a retired firefighter. There were no injuries and damages would be assessed on Friday. 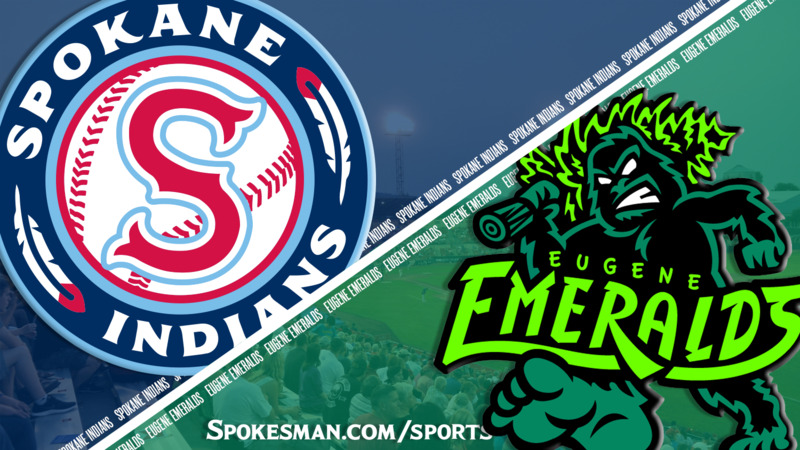 On the field, the Eugene Emeralds rallied for five runs in the top of the 11th inning to beat the Spokane Indians 9-4 in the second of a five-game Northwest League series at Avista Stadium on Thursday. With an automatic runner at second base in the 11th because of the new minor league extra-inning rule, Emeralds No. 9 hitter Luis Vazquez laid a bunt down the third-base line to move the runner over and reached without a throw. Fernando Kelli followed with a perfectly placed drag bunt for a base hit to plate the go-ahead run for Eugene (10-17). A sacrifice by Clayton Daniel moved both runners up, and Luis Diaz’s single up the middle made it a three-run game. Nelson Velazquez then clubbed a two-run shot off the scoreboard in right-center field to sent fans scurrying for the exits. The Indians (9-18) went quietly in the bottom half. This came after the Indians loaded the bases in the bottom of the 10th with no outs and followed with three pop-outs – none more than 20 feet off the infield dirt. Righty Tai Teidemann, making his fifth start this season for Spokane, was shaky from the start. With one down in the first, he gave up a single back through the box by Daniel, and Diaz followed with a short fly to left that Jonah McReynolds lost in the afternoon sun. Tyler Durna ripped a single to right to plate Daniel, and Starling Joseph’s throw home airmailed catcher Scott Kapers, allowing Durna to take second. Velazquez walked to load the bases, but Tiedemann settled to get a strikeout and fly out to end the threat. Eugene starter Zach Mort didn’t fare any better. Jax Biggers, in his Indians debut, laced a one-out single up the middle and scored on Diosbel Arias’ homer that just cleared to fence past the notch in the fence in right field. It was Arias’ second homer of the campaign. Eugene used a pair of walks and two run-scoring singles in the fourth to momentarily take a 3-2 lead, ending Tiedemann’s evening. He allowed three runs on four hits and four walks with three strikeouts over 3 2/3 innings. The Indians got both those runs back in the bottom half. Cristian Inoa drew a two-out walk and Joseph hit a line-drive homer to right-center, his third of the season. The Emeralds tied it in the fifth. Velazquez singled with one down and stole second. After Kwang-Min Kwon drew a walk off Royce Bolinger, Gustavo Polanco got one through the right side for a run-scoring single. The top of the 10th started with some controversy. With automatic baserunner Jonathan Sierra at second, Polanco lined one to center and J.P. Martinez made a diving catch. Sierra attempted to tag, but Martinez threw behind the runner and the umpire ruled Sierra left early for a double play. Eugene manager Steve Lerud came out to ask whether Martinez actually made the catch. After a brief discussion, the call stood. Published: July 12, 2018, 10:34 p.m. Updated: July 13, 2018, 9:49 p.m.